Amager Brygghus is a small Danish brewery with an impressive list of beers, several awards and ranked highly among the best breweries in the world and despite being close to Sweden (where I live) their beers can sometimes be difficult to lay your paws on. The respect Morten Valentin Lundsbak and Jacob Storm have earned throughout the years have paved ways for collaborations with well-known breweries such as De Molen, Hoppin Frog, Port Brewing and Goose Island and as you soon will read there are a couple of new collabs being brewed later this spring. Over the last 12 months they have also gone from a two-man operation to hiring two additions to their team as well as making an investment in a new brewing system. The beer list, which you can read at the end of the article is really interesting with a brand new line-up of beers including a one-off lambic series, a Flemish red and a black American pale ale. We asked the brewery team all the questions you might need an answer for to get to know the brewery better before the celebration as well as their suggestions for where to drink the best beers after the sessions. Do not miss them at CBC! 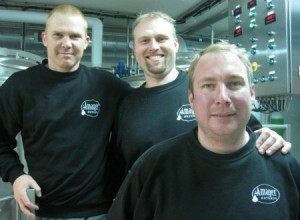 MankerBeer (MB): Founded in 2007, Amager Bryghus is one of the most known and well-respected Danish breweries, what is the success story of Amager Bryghus? Amager Bryghus (AB): Well, that’s not a question that is easily answered in short From the start off we have been following a strategy with 2 legs: we have brewed a series of beers with local names aimed mainly at the local market. Good, solid and well brewed beers, but at the same time not very challenging beers. These beers sell really well locally – being our “cash cow” if you prefer. But it’s no secret that our heart lies elsewhere. Our second leg is what makes brewing fun: hoppy, huge, weird, black, sour beers – you name it! We love to experiment, we love to play around and have fun. It would simply kill us if we had to brew the same 5 beers for the rest of our lives. These are the kind of beers that have opened the eyes of beer geeks nationally and abroad. And as a consequence has made us interesting for beer importers all over the world. In 2013 almost 50 % of our production will be sold outside Denmark, Amager beers can be found in 15 countries. Many Danish microbreweries have bowed down since the boom of the “Danish Beer Revolution”. We believe that we’re still here because we cater to all beer drinkers – and we respect all beer drinkers. And when it comes to investment and expansion we’ve always been extremely conservative preferring to make the money before we spend them. MB: You have received great awards from all over the world and made collaborations with several of the most respected brewers and breweries in the world – what have been the high peaks so far? And yes we really enjoy collaborating, that’s our play day when those are happening. One particular great day was when we had Mike Rodriguez and Tomme Arthur of Port Brewing/ Lost Abbey visit to brew the first batch of Wookiee IPA. That beer has been so successful that it has become a member of our regular line up of beers. Actually, in the 3 days just before CBC starts we’ll be doing 3 collaborations 3 days in a row – with Against The Grain, Three Floyds and Cigar City. Really looking forward to that – it’s a great way of making friends in the brewing business, and to exchange views, opinions and tricks. MB: Apart from the Nordic countries and northern Europe you export to North America and Australia. When I visited the brewery 2 years ago I was told that there soon was not capacity enough to still the demand, you then acquired a new brew work. For how long can the new equipment satisfy the demand and can you expand further within the current premises? AB: Well, that’s actually a very good question. Already in the first year with the new brewhouse we doubled our production and had no problem selling every drop. In 2013 we’ll probably add another 20-30% to that and then – once again – we’re at maximum capacity. So now what? Well, as said before we’re rather conservative in the way we handle capital, so everything we do is considered in detail – and for very long. We cannot really expand in our current rented facilities, so the next step would be finding or building our own brewery. Right now we’re very happy with the way we share warehouse facilities with Mikkeller and drikkeriget.dk as they bring a lot of dynamics and life into the house. So hopefully a future move could still maintain a working business partnership with these guys which we also consider good friends. But bottom line is that we’re staying where we are – at least for now – working hard towards our next step. MB: For being such a small country, Denmark has given birth to quite an amount of great brewers and breweries, what is it in the Danish gene pool that makes you such great brewers? AB: If you had asked this question 10 years ago we might have laughed since the first wave of Danish craft brewing contained an awful lot of terrible and infected beer! So I don’t think a foreign beer lover would have considered the Danish beer scene back then as one containing a lot of great brewers. But luckily the general quality level has gone up for almost all breweries. But speaking in general terms Danes have always been curious. We’re one of the most travelling nations in the world we like to seek out new territory. It’s not anything different in the beer world. And since we had been starved for ages with breweries offering mainly bland lagers of little interest then the bubble burst with a big splash when it eventually burst – leading to the Danish beer revolution. Because abroad Danes had experienced that beer could be so much more than what they were offered in their local supermarket. MB: The Sinner Series has now been completed; can we expect something similar in the future? MB: You recently hired expert beer drinker/ticker Henrik Papsø – what will he be doing for Amager? How does it feel to go from a two-man operation to involve more people like Henrik and René Hulgreen? AB: René has really helped boost production on the new equipment. With an extra brewer we can simply get more brews done, also at times where we holiday, have to travel or go to beer festivals etc. It’s been working perfectly, as René is a skilled brewer and a very pleasant guy to work with. Henrik Papsø has actually been with us since the start – at least on the side writing press releases, label texts etcetera etcetera in his spare time, but only paid in beer! When we employed him, we let him pick his own title and he chose Head of Communications since he is a journalist by trade. But he’s also our Export manager, he conducts tours and beer tastings, arranges our participation in collaborations and beer festivals – and a ton of other things really. Of course it’s always a challenge to bring in new people into a small closely knit organization of only two – and to be honest we might not always have the most easy personalities. But things have been going surprisingly smooth – probably because they were handpicked and we knew them very well beforehand. But their results are already quite visible to us. But you know, different opinions and views are very rewarding – even if we may not embrace them, the first time they are presented to us! MB: As Copenhagen citizens what places (restaurants, bars, beer stores, historical places etc) would you recommend the beer freaks coming to CBC to visit? AB: If you’re in Copenhagen for CBC only, I think your time to do touristy stuff is very limited. So why not use your few spare hours – to have a beer… With the recent openings of Mikkeller & Friends, Søernes Ølbar and Bryggens Ølbar Copenhagen has really turned into a beer haven. So check out some of these new beer bars – and support them for all their great work for the craft beer world. AND all the other established great beer places of course. MB: As a CBC veteran, what is the best thing with CBC? How important is the interaction between brewers at a festival like this? AB: Extremely important, and that’s part of what makes this beer festival different and very special. Because our brewery is so focused on exports, the breweries we compare ourselves with are quality craft brewers from the rest of the world. To meet them, try their beers – and have them try ours – and make friends across borders is both fun and rewarding. MB: Amager Bryghus is probably bringing one of the most interesting line-ups of beer to CBC, what can you tell us about the beers? AB: Well, it’s quite a challenge to be told to produce 9 new beers, but we thought – what the heck, let’s just bring 10! No Rice & Curry will be on during all 3 sessions – the other 9 on different sessions. But all are regular debuts at CBC. Some will appear on other festivals and a few of them will, also be released in bottles. But really, this was a great chance to try some of the recipes we had in the book. Hell, without the CBC some of these beers may never have been brewed! MB: What should beer fans really not miss at Copenhagen Beer Celebration? AB: Well, the 3 fruit lambics are one-offs for sure. We brewed the base lambic 3 years ago on the old equipment and it has been resting on 3 Bourgogne barrels ever since. One of the barrels have turned vinegar, but the two others were nice. It’s probably our most expensive beer to date: buying fresh fruit in the middle of the Danish winter cannot be recommended! There’s only 40 litres of each. The days Of Barley And Roses is also a one-off in this non-barrel-aged version. It will later appear in a port barrel edition. And even if huge Imperial Stouts are getting out of fashion you really should try Double Black Mash – as it’s all-grain as opposed to so many others in the same style. It’s really motor oil – yet strangely balanced. But many of the first are simply not ready as we write – so we really have no clue as to how they come out! Hope to see you all – and really looking forward to it! Thank you all at Amager for answering our questions and for offering this great list of beers! Changes may occur and except for No Rice and Curry the beers will be poured during different sessions. Pinks will be able to try them all.